In government, influence denotes one's ability to get others to act, think, or feel as one intends. A mayor who persuades voters to approve a bond issue exercises influence. A businessman whose promises of support induce a mayor to take action exercises influence. In Political Influence, Edward C. Banfield examines the structures and dynamics of influence in determining who actually makes the decisions on vital issues in a large metropolitan area. This edition includes an introduction by James Q. Wilson, who provides an intellectual profile of Banfield and a review of his life and work. Banfield locates his analysis in Chicago, focusing on a broad range of representative urban issues. An introductory chapter defines Banfield's method through four leading questions: Who has influence and who is subject to it? How does influence work? What are the terms upon which influence is expended? How is action concerted by influence? Banfield's conceptual scheme is applied at three levels. He offers six case studies of political influence, showing in considerable detail how influence was used in certain civic controversies. Then Banfield interprets these case studies, drawing from them a set of low-level empirical generalizations. At the third and highest level of generality, he explores the logical structure of significant aspects of influence and recasts the empirical findings in analytical terms, developing theories that apply generally to situations involving political influence. He also defines the key roles played by officeholders, the newspapers, business interests, the city council and minority groups. 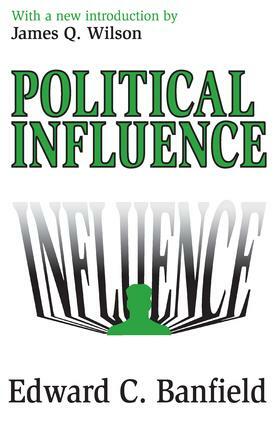 Political Influence is notable for its depth and sophistication. This rare combination of good reporting and insightful analysis is essential reading for political scientists, urban affairs specialists, policymakers, and sociologists.